To assess future transition pathways for sustainable agriculture through the development and operationalisation of the concept of ‘regional sustainability of agriculture’. To identify mechanisms to provide viable models for young farmers, through an analysis of the engagement of young people in initiatives, evaluating the issues, preferences and challenges (including gender) facing young people in agriculture at local, regional, national and European levels. To develop evidence-based policy recommendations at farming system, regional, national and EU levels for identifying and pursuing future transition pathways and social and technological innovation needs. To initiate a network of regional level stakeholders and organizations involved in transition processes in agriculture and to further equip, enable and consolidate it. To provide resources for policymakers, academics and other stakeholders in order to develop their understanding and enable pursuit of transition towards regional sustainability of agriculture in their own efforts and organisations. 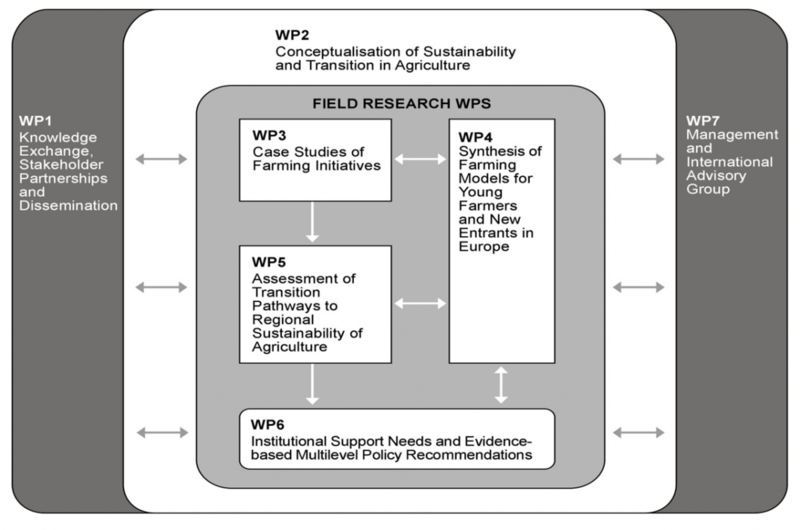 The diagram below illustrates each of the seven work packages (WP) that make up the FarmPath project, and their linkages to each other.